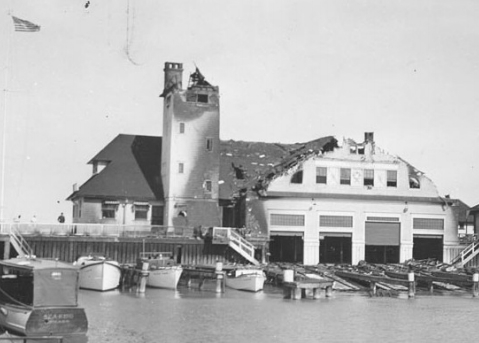 July 6, 1935 – The razing of the old Coast Guard station at the mouth of the Chicago River begins, work that is expected to take three weeks to complete. Dedicated in 1903, the station’s days became numbered when part of it was destroyed by fire in 1933. As soon as the demolition is complete, work will begin on a new station with work expected to wind up by late fall. The old station had responded to 8,454 calls for assistance. The old station with flag still flying proudly is shown above. 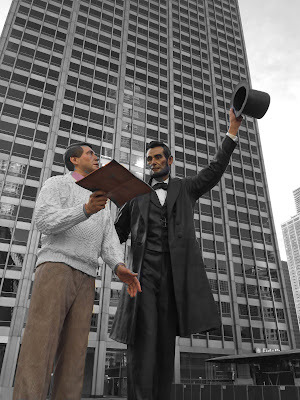 July 6, 1964 – The 35-story Equitable building, now 401 North Michigan Avenue, is topped out in a light rain as a 35-foot white beam with the names of 6,000 Chicagoans written on it is hoisted into place at the top of the tower. Also on the beam is the number 192,113,484, corresponding to the population of the United States at this time. The building, designed by Skidmore, Owings and Merrill in the mid-century modern style, is already 75 percent rented. At a luncheon for about 200 civic and business leaders at the Sheraton Chicago Hotel, James F. Coates, the chairman of the Equitable Life Assurance Company of the United States, says that the landscaped area to be built south of Tribune Tower and in front of the Equitable building will be “the most beautiful in the world.” [Chicago Tribune, July 7, 1964] Currently the trees that have stood in that area for 42 years have all been cut down and the area itself is surrounded by fencing as construction continues on the new Apple store that will sit in the plaza south of the building. In the above photo 401 North Michigan rises to the behind J. Seward Johnson's sculpture, Return Visit.